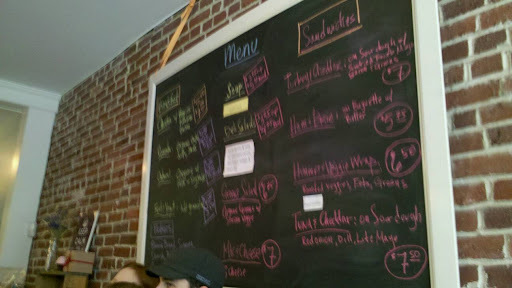 Yesterday PghTasteBudA and I went to Dozen Bake Shop in Lawrenceville. I was surprised at the local buzz this bakery has generated in the area and needed to check it out for myself. For a bakery that specializes in cupcakes, they offer more than baked goods. If I’d have known, I would have prepared myself to try a meal there. With several full tables of patrons, we decided to get our baked goods to go. So after eating the spicy chili, I settled down with a nice glass of white wine and my pastry. The pairing was unintentionally smart, as the sweetness of the wine highlighted the pastry. The pop tart revitalized my opinion of peach pastries. The filling was wonderful. Not overly sweet or chunky which was my main problem with the mélé. 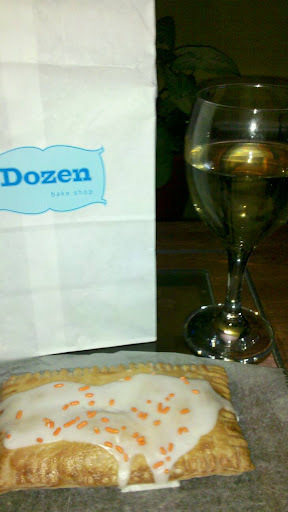 Thank you Dozen Bake Shop for the pop tart. I don’t believe peach ones are offered in the grocery stores. Your reinvention of this pastry is one of the many things that make you a destination within Lower Lawrenceville. I look forward to discovering the other flavors of pop tarts you’ll offer. Might I suggest a s’mores, lemon and blueberry, or white chocolate raspberry variety! Check out their new commercial! Wonder where we’ll see it on TV first?